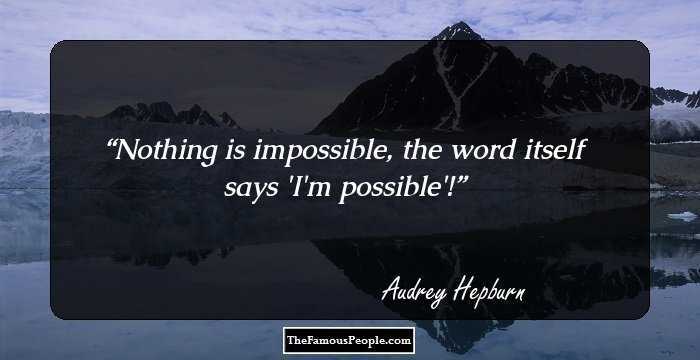 190 Mind Blowing Kirsten Dunst Quotes That Will Leave You Awestruck! 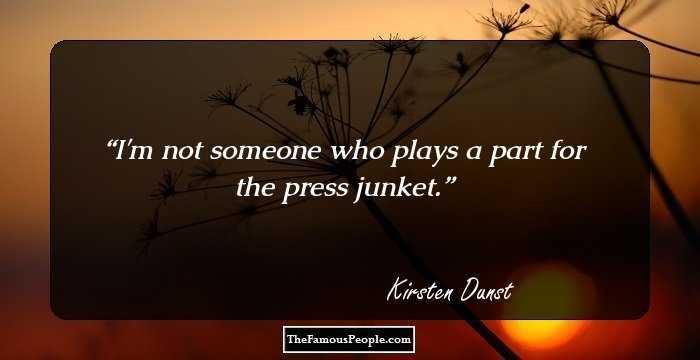 A collection of mind blowing quotes and sayings by Kirsten Dunst on, life, love, relationships, confidence, family, goals etc. Kirsten Dunst began her acting career as a child artist and earned recognition for her portrayal of Mary Jane Watson in the 'Spider-Man' trilogy. Despite winning numerous awards and honors for her roles, she succumbed to depression around 2008 and following a successful treatment, publicly talked about her predicament to raise awareness and dispel rumors about drug and alcohol abuse. She has often been very vocal about her support for democratic candidates and once narrated a documentary about voting to "influence people in a positive way". 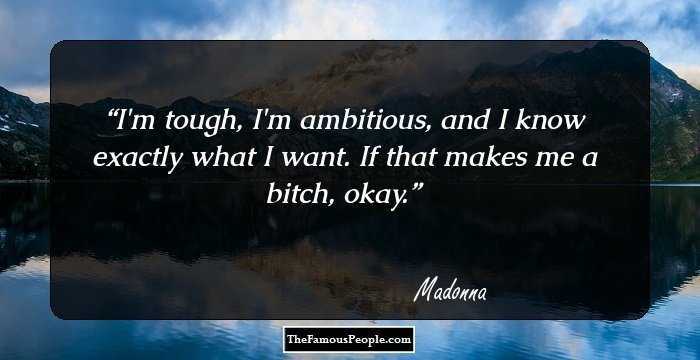 We have collected a bunch of her inspirational quotes from her interviews and speeches. Through her talks, she attempts to raise awareness about issues like depression, child healthcare, and breast cancer. 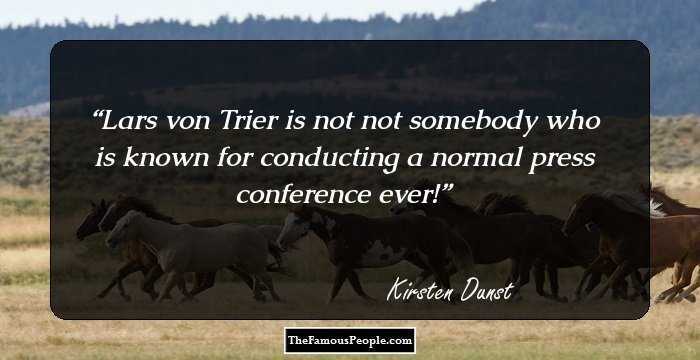 Lars von Trier is not not somebody who is known for conducting a normal press conference ever! 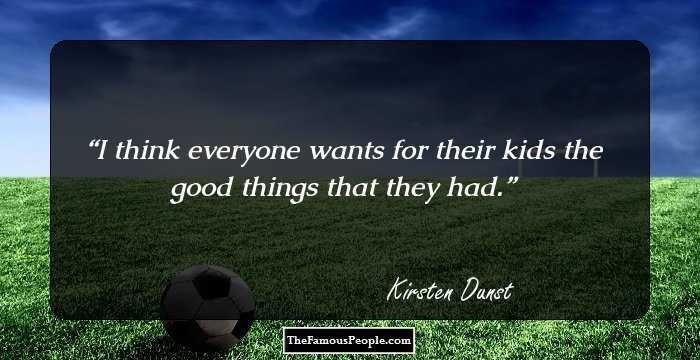 I think everyone wants for their kids the good things that they had. I'm not someone who plays a part for the press junket. I mean look at Antichrist. 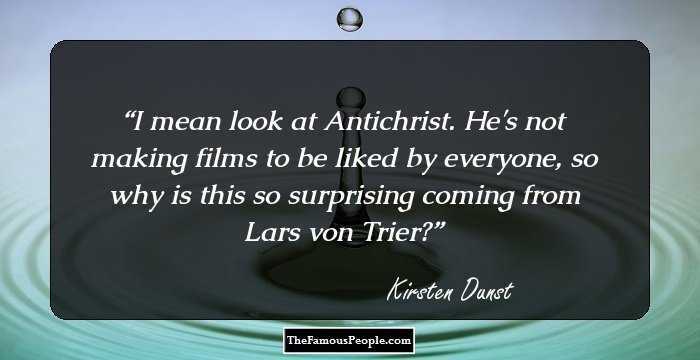 He's not making films to be liked by everyone, so why is this so surprising coming from Lars von Trier? I don't really want to talk about my personal experience. It's something that I have talked about just because it came out in the press but I've tried to navigate the waters in my own comfort-ability. I get to do all these crazy things in the movies. 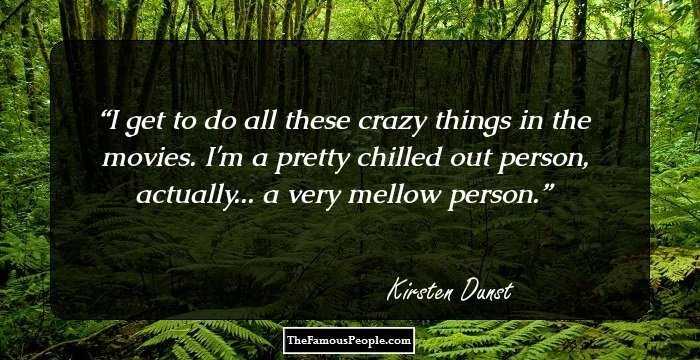 I'm a pretty chilled out person, actually... a very mellow person. It's interesting to watch people go through it in something like this. I mean, what other then Melancholia films do they portray depression in? I can't watch my movies and get into them because as soon as I see myself I get taken out of the film. 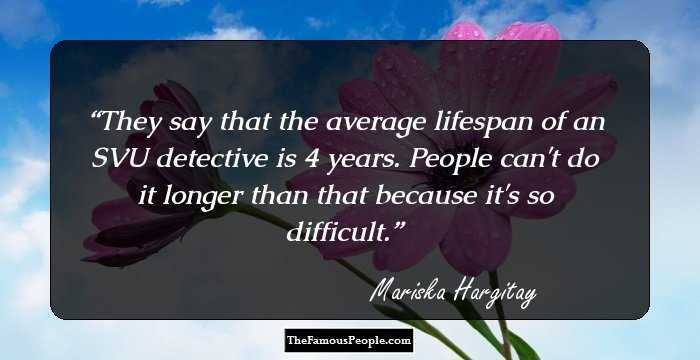 I like to think that death gives life meaning. I like that philosophy. I'm not someone who is scared of doing things out of the box. I've learned to do a movie and then not be in that place for a long time. I was allowed to have an imagination rather than a need to be entertained all the time by television or computers or anything like that. So, I think it's helpful to try and give your kids. I think that certain directors are better at choosing actors that match well with each other. And I have feelings about actors and who I think I'd work well with better moreso than others. A singer is someone who puts out an album. That's a very generous description. To be in someone's favorite film is just - that's what you want. You want to be in great films that are memorable. Charlotte Rampling is someone I've wanted to work with for a very long time. I've always looked up to her as an actress and it's a reason why I feel brave to do a film like Melancholia. So, to me she's the ultimate. I think you either get along with Lars [von Trier] or you really don't and I really got along with him. I wasn't scared because I talked to Bryce Dallas Howard about Lars. It's nice when the movie is not on your shoulders, too. It's fun to do a smaller part sometimes. I would love to play Marlene Dietrich in a movie. My dad's from Germany and so I feel like that would be a really interesting person to play. I'm a person who likes to hang out. I would never go on a blind date. That sounds like the most uncomfortable thing on the planet earth. It's like, 'Hi. Nice to meet you. So, what kind of music do you like?' Date ended. I think vegetarians - for a lot of them - it's about a lack of commitment to life and relationships. 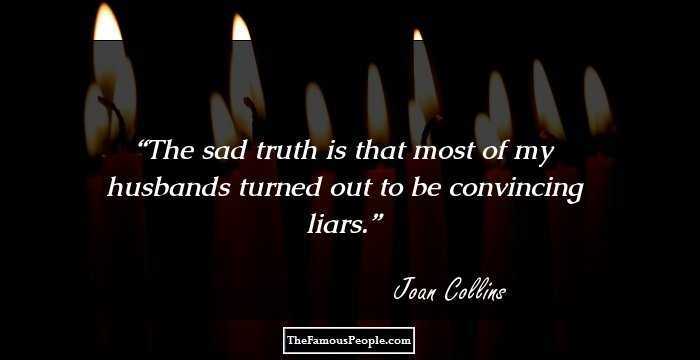 There are some who just like the fact that they're controlling something in their life. It's hard to get lost in a scene, to get into a character when everyone's standing around you on the set. It's such a private thing - 'my process' - I can just say that the work that I do is like therapy between me and the character. I've always been someone who is pretty hard on herself. But I've lightened up a lot. People always tell me, Don’t work so much, but I can’t help it. I feel like all the things I’ve done are important to get to this adult stage now and now I’m getting all these adult offers, so it’s working. I think it's best to date someone who doesn't do what you do. You lose like five pounds immediately, and your face is glowing and gorgeous! I didn't go to Cirque Lodge for alcohol abuse or drug abuse. So many teen films are overproduced and people are going to burnout on the subject. I'm the kind of person who buys a new thing, wears it so much and then is totally sick of it. I'm always looking for that movie that feels like it's hitting me where I need it. I've been an REM fan since I was a little girl. I would jump around to 'Stand' in the mirror. After “Melancholia” and “On the Road,” I wanted to do a comedy. And I did so many comedies when I was younger, but if you’re not consistently in those movies, people don’t always think of you for them. I'm a good assistant. That's why I don't have an assistant, because I'm so on it that no one can be as on it as me. 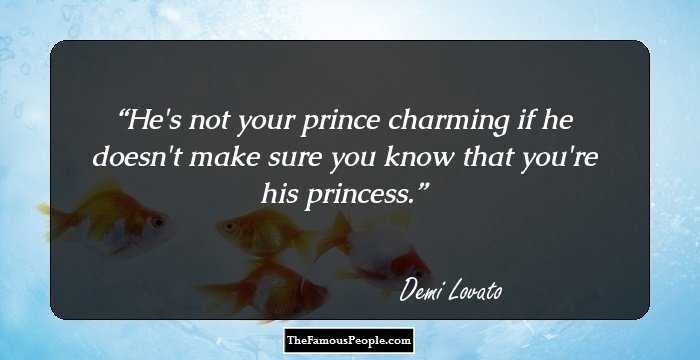 I know that. Being an actress doesn't make you popular in school. I hate red carpet photographs! I don't want to be 'box-office girl,' but I don't want to be 'that indie girl' either. I don't live in the spotlight, and I don't live my life in front of the paparazzi. I live very comfortably and quietly as possible. I don't think roles help you resolve your issues. I just think they're good markers. And sometimes, you need your knight in shining armour. My favourite food at the moment is Pasta, “with tons of shaved Parmesan on the side. Not crumbly but like the hunks, you know what I meanwhen you get the thin slices. Obviously I’m a feminist. It’s ridiculous that anyone would think other of me. If I'd trusted myself and listened to myself all the times that I ignored myself, I would have been fine. But everyone has to learn their lesson, and now I've got it. I think that most human beings go through some sort of depression in their life. And if they don't, I think that's weird. I've never had a teenage rebellion, I'm not that type of person. I always work out my problems in a conscientious way. I don't gossip about myself. I've always used my own personal emotions and things that I've gone through in my life to build a character. The work that I do before a film feels almost like therapy, between me and whoever I'm playing. I think for everyone it's good to have your own personal work on a character and a film before you even start rehearsing, to have an inner life. I love what I do and I dont want to stop - This is all Ive ever wanted. I liked the girly cartoons. I was very much a girly-girl. I know kids are supposed to go through these awkward stages, but I just never even thought about that. I was too busy worrying about getting my education while I was working. I feel like everyone directs their own career according to their taste, what they migrate to emotionally and what kind of artists they want to work with. I love to produce, and I've directed two short films. I was a very imaginative and theatrical child and wasn't afraid of being in front of a camera. 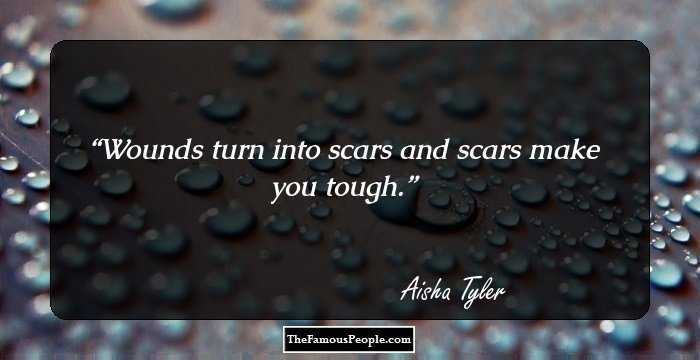 Everyone goes through a hard time in their life. My grandmother lives with my mother in a gorgeous house in the San Fernando Valley. I am afforded these luxuries, and I'm very young. I think you see in people's eyes what they've been through. Anything in their lives shows up in their eyes.